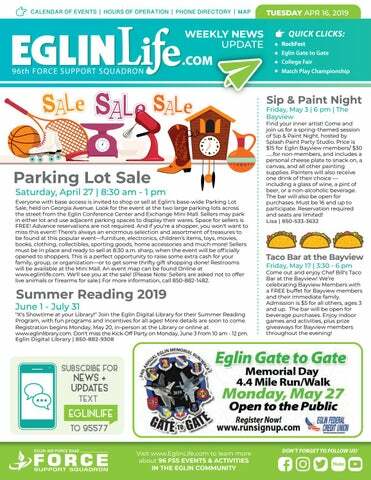 Saturday, April 27 | 8:30 am - 1 pm Everyone with base access is invited to shop or sell at Eglin's base-wide Parking Lot Sale, held on Georgia Avenue. Look for the event at the two large parking lots across the street from the Eglin Conference Center and Exchange Mini Mall. Sellers may park in either lot and use adjacent parking spaces to display their wares. Space for sellers is FREE! Advance reservations are not required. And if you're a shopper, you won't want to miss this event! There's always an enormous selection and assortment of treasures to be found at this popular event—furniture, electronics, children's items, toys, movies, books, clothing, collectibles, sporting goods, home accessories and much more! Sellers must be in place and ready to sell at 8:30 a.m. sharp, when the event will be officially opened to shoppers. This is a perfect opportunity to raise some extra cash for your family, group, or organization—or to get some thrifty gift shopping done! Restrooms will be available at the Mini Mall. An event map can be found Online at www.eglinlife.com. We'll see you at the sale! (Please Note: Sellers are asked not to offer live animals or firearms for sale.) For more information, call 850-882-1482. Come out and enjoy Chef Bill's Taco Bar at the Bayview! We’re celebrating Bayview Members with a FREE buffet for Bayview members and their immediate family. Admission is $5 for all others, ages 3 and up. The bar will be open for beverage purchases. Enjoy indoor games and activities, plus prize giveaways for Bayview members throughout the evening! Eglin is set to host Air Force Entertainment's Live Stage Rock Festival featuring Grammy-nominated band Sum 41 with special guest band We The Kings at Postl Point on Saturday, May 11. The day will kick off with an opening ceremony at 2 pm followed by a food truck rally and beverage sales, a car show featuring Emerald Coast Exotic Cars of Destin, and an appearance by popular local band Swingtown. The main stage opens at 7 pm. with performances by We The Kings followed by Sum 41. Admission to the event is FREE and open to all DoD ID card holders and their guests. Audience members are welcome to bring lawn chairs or blankets for concert seating. Video or audio recording is not permitted. Backpack and large handbags are discouraged, and such items may be subject to immediate search upon request. The event is brought to you by Air Force Entertainment (AFE), a part of the Air Force Services Activity. AFE's ongoing mission is to provide installations with no-cost quality entertainment for Airmen and families. 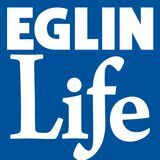 NO FEDERAL ENDORSEMENT OF SPONSORS OR ADVERTISERS INTENDED.. . . . . . . . . . . . . . . . . . . . . . . . . . . . . . . . . . . . . . . . . . . . . . . . . . . . . . . . EglinLife.com Weekly News Update is published every Tuesday by the 96th FSS Marketing Ofﬁce to promote FSS events of interest to the base community. The Community News section highlights additional FSS events and information from other units also of interest base-wide and included as space allows. More information is available by calling the Marketing Ofﬁce at 850-882-1482. An advertising rate sheet is available for businesses and private organizations interested in advertising. All information published herein is subject to change without notice.